From its first entry [Virginia Dare, first child born on American soil, 1587] to its last [Drew Gilpin Faust, named first female president of Harvard University, 2007], Her Storycontains an impressive collection of accomplished women in the fields of arts & entertainment [Martha Graham, Hattie McDaniel], science [Maria Goeppert-Mayer, Mabel MacFerran Rockwell], medicine [Virginia Apgar, Helen Brooke Taussig] , academia [Elizabeth Peabody, Shirley Ann Jackson], law [Marian Wright Edelman] , politics [Ann Richards, Shirley Chisholm], women’s issues [Lucy Stone, Betty Friedan], sports [Babe Didrikson Zaharias, Chris Evert], and business [Ann Fudge, Lillian Vernon]. The lavish book includes many female firsts and groundbreaking women. Whether from little-known names [Kaahumanu, Bessie Coleman, Genevieve Cline, Frances Bond Palmer, Jerrie Cobb] to more recognizable women [Emily Post, Ella Fitzgerald, Penny Marshall, Whoopie Goldberg, Elisabeth Kubler-Ross] or by achievement, the exquisite presentation of Her Story reminds the reader of the important contributions by women. 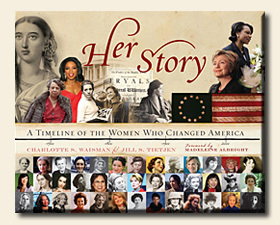 This is an amazing, beautiful and fascinating guide to U.S. women’s history. Her Story must be shared. This entry was posted on March 19, 2010, 02:52 and is filed under Books. You can follow any responses to this entry through RSS 2.0. Both comments and pings are currently closed.